It’s been truly exciting times for us, since the start of our Obecto cooperative. We’ve reached heights, exceeding all of our expectations of what we can achieve together. We proved that we can collaborate as a strong and united cooperative and bring to life amazing projects. Today Obecto is a working proof of the cooperative business model, embodying our initial vision: a liberalized software development within a self-organizing structure. Now we know that this is the right path. But it was far from clear when we first started our transformation. A small conference room, a whiteboard and a group of talented developers is all we had back then. The list of what we did not have, on the other hand, was far greater. No scalable infrastructure, no clients to believe in the new cooperative model. Not a clear go-to-market strategy or a proper website even. But that didn’t stop us. On the contrary, we were motivated to succeed. And succeed we did – thanks to the ever-growing team of amazing people who truly believed in the value of what we all wanted to build. The same people that have always been in the heart of Obecto. This article is a tribute to their talent and hard work that set the foundation for the years to come. Now, it’s also the time to share our bold plans for the future. Building software projects as a digital cooperative! Obecto’s new business model was recognized and trusted both by small startups and large enterprises. These partnerships lead us to the development of a diverse set of software products. These include several MVPs for startups like TrevorAI (task management assistant), where we helped founders to quickly get their ideas implemented as actual products. We are also partnering with some truly ambitious startups like 4hundred, a digital energy retail provider, which just started operations in Germany. Obecto was also trusted by large enterprises with the likes of Saudi Aramco and Sanofi, both global leaders in their respective fields. Go&Save – a mobile app for discovering local promotions and discounts. In February 2017 our new business model started to show on the radar of more than a few media outlets. 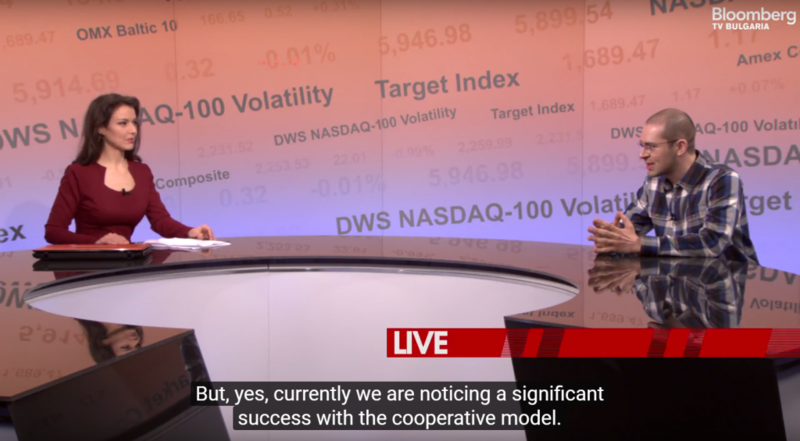 This resulted in several great interviews with the founder of Obecto, Todor Kolev appearing on Bloomberg TV and featured in the Economy magazine in two subsequent isses with articles about “The big brother of the startups” and “Company without bosses”. Todor was also invited to this year’s edition of TEDx where he gave a very insightful talk on “The Future of Capitalism” and why Obecto evolved into a digital cooperative. During this year, we made some great friendships and partnerships, supporting several organizations integral to Bulgaria’s startup ecosystem such as Founders Institute, the pre-accelerator program UniStart and the entrepreneurship network StartUp Grind. We took part in the International Summer Research School in partnership with the Bulgarian Academy of Science, mentoring high-students in doing research papers. In addition, given the fact that several of Obecto’s members have graduated from the same school, the National High School of Mathematics and Natural Sciences, we were delighted to make a donation to the institution. Before the beginning of the new school year, we equipped a whole new Informatics classrooms with modern and powerful computers. Last summer we also treated ourselves to a Work & Play Summer Camp in the Bulgarian sea town of Sozopol. We learned that work and pleasure can and should go together and we established it as a tradition now, with a second edition just last month, on the sunny beaches of Ravda. From day one we knew that if we managed to adopt the cooperative model, it would be just a stepping stone. An MVP of sorts. It would prove to us that we are not alone in our vision for transparent and fair cooperation, doing business and ultimately living. And what is really exciting is that for the past year we witnessed a collective need emerging for such an alternative. Not just locally, but globally. We now live in a time where we as people no longer want to be just a cogwheel in large corporations. We see that through technology we don’t have to be confined to a single building (or a country even) for a half of our waking time. Today we can collaborate on projects we like with teams anywhere on the map. In this new world, we also dare to finally see beyond Uber and AirBnB as the pinnacle of the shared economy. We are getting excited about cryptocurrencies, but they are just the tip of the iceberg. It is what else can be done with the blockchain that is really fueling our imagination. Realizing that this technology may be the key to a new economy, new lifestyle and what would become a new definition of personal freedom. This technology allows us to collaborate, manage agreements, fund each other ideas and share profits. All of which as we see fair. Blockchain allows us to establish autonomous digital cooperatives, managed through democratic consensus. It seems that all we need is a platform to do it. And that is exactly where we are headed! Stay tuned. Follow us on Facebook. We will share more details regularly as we enter the next phase.